The Russian Orthodox Church is worried about the persecution of Christians in Syria and other Arab countries where regimes changed rapidly, a top Church official said. “We are deeply worried by what is going on in Syria, where radical forces are trying to come to power with the help of Western powers,” Metropolitan Hilarion of Volokolamsk, chairman of the Russian Church’s Department of External Church Relations, told journalists. “Where they come to power, Christian communities become the first victims,” he said. Metropolitan Hilarion on Tuesday spoke at the UN General Assembly’s social and humanitarian affairs committee and met with UN chief Ban Ki-moon. He also cited Iraq as an example, saying that 1.5 million Christians lived in the country 10 years ago, and adding that the number has significantly decreased since. Many have been killed or forced to escape to other countries, the metropolitan said. The current number of Christians, a minority in mainly Muslim Iraq, does not exceed 350,000, and it was above 1 million before the Gulf War in 1991, according to human rights watchdog Open Doors USA. 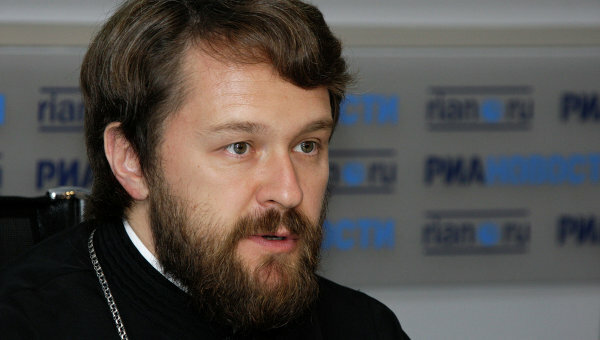 Metropolitan Hilarion said the topic of the persecution of Christians is being hushed up by Western press and is not on the UN or other international organizations’ agenda. “The talk is not about insufficient tolerance, but about a real full-scale persecution of Christians that embraces different countries and whose victims are tens and hundreds of thousands of Christians,” he said. Russia, the Russian Church official said, is the key force trying to prevent Syria from the repetition of the Libyan or Iraqi scenarios. “We should not just speak on the topic, but create a mechanism that would prevent further indulgence toward persecution of Christians,” he said. The Syrian conflict has claimed tens of thousands of lives, according to various Syrian opposition groups. The UN puts the death toll at 20,000-30,000 people. The West is pushing for Syrian President Bashar Assad’s ouster while Russia and China are trying to prevent outside interference in Syria, saying that the Assad regime and the opposition are both to blame for the bloodshed. Veto-wielding Moscow and Beijing have three times blocked sanctions resolutions on Syria. Mainly Muslim Syria has seen violent attacks on Christians since the start of the conflict. “As the Arab Spring continues to rage throughout Syria, thousands more people have lost their lives in a movement that seeks to strip President Bashar al-Assad’s regime of its power. And as Islamic protesters clash with government forces, Christians have become hopelessly tangled in the crossfire,” Christian Freedom International, a human rights organization, said on its website. “Although the Syrian church has historically enjoyed peace and religious freedom under the Assad regime, the Arab Spring has destabilized that peace, as Christians are now typically perceived as supporters of the existing government,” it said.